Online networking; a matter of introversion preference? If you’re spending all your time networking online instead of getting out there and meeting with fellow jobseekers and business people, you’re doing yourself a disservice. More than 60% of jobs are gained through personal networking, according to the DOL. There are no statistics on the success rate for obtaining employment using online networking; although, I’m willing to bet it’s much lower than personal networking. Through deductive reasoning, people who are extremely active on social networking sites, e.g., LinkedIn, Twitter, and Facebook, are most likely less active in their personal networking activities. Is this a result of one’s personality type, namely introversion. In an article on Career-Intelligence.com, Jennifer B. Kahnweiler, Ph.D., author of The Introverted Leader: Building on Your Quiet Strength, writes about the introverts’ aversion to talking and preference for writing. I’ll cite myself as an example. Here I sit typing away when I could be talking on the phone, at a social gathering, or in the next room with my children watching their mind-numbing TV programs. I freely admit that I spend too much time writing blog articles or answering questions and reading responses on LinkedIn. I’m an introvert, and spending time online suits my personality type more than social interaction, especially after a day of leading workshops to numerous people. It’s my downtime and opportunity to recharge my batteries. More to the point, I thoroughly enjoy writing articles and answering questions and reading answers posted by others on LinkedIn. Other introverts have told me that they enjoy the non-personal interaction that LinkedIn and the others offer. These happen to be my jobseekers who are hoping to secure jobs through the job boards or LinkedIn. They tell me they’re more comfortable looking for work this way. That said, it’s a mistake to think that doing all your networking online will aid you in your job search. I’m not implying that all introverts conduct their job search this way, nor do I believe that extraverts avoid online networking sites. Introverts also have the capacity to personally interact with other jobseekers; it just requires more energy to sustain a whole day of being around people. What is your best way to approach networking? A combination of personal and online networking is a great strategy, because you’ll combine the most effective method to look for work (personal networking) with a growing and proven form of gathering contacts and opportunities to reach out to them (online networking). Read my colleague Wendy Gelberg’s article on online networking to learn more about the importance of online networking; but keep in mind not to neglect personal networking. This entry was posted in Career Networking, LinkedIn and tagged Extraversion and introversion, Extravert, face-to-face networking, Introvert, Jennifer Kahnweiler, LinkedIn, online networking on January 4, 2014 by Things Career Related. Online networking HAS to move the conversation forward to either talk on the telephone or where appropriate meet in person. I think an introvert can SO use online networking to be able to with more confidence and courage – at least – pick up the telephone. 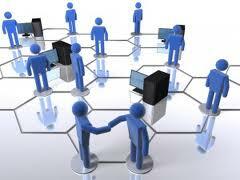 Perhaps online networking is a good start to personal networking. Once you make that online connection, I tell my jobseekers, you need to reach out on a personal level. Only then will the connection be truly cemented. I network via Twitter as well as in person. I usually meet with emplioyed and unemployed professionals at least three times per week. I am only on-line 20% or less of the time. The job market is very competitive today, so making face time and meeting people, for networking is key. Do you consider yourself to be an introvert? Do you feel more comfortable talking than writing? Are you the center of the party, or do you sit in the corner with one or two people? If you haven’t taken the Myers-Briggs, you should. Thanks for the comment, Nancy. Bob, as with most things in life, successful networking requires a balance – in this case between the mediums of online and offline engagement. I’ve been networking since 2008, and have come to the conclusion that the most successful practice is meeting contacts in person, then using social media to continue to build a relationship with them (assuming they are online – most are). Hence, I believe that the introvert is at a disadvantage, and must strive to overcome their proclivity to shun personal engagement.